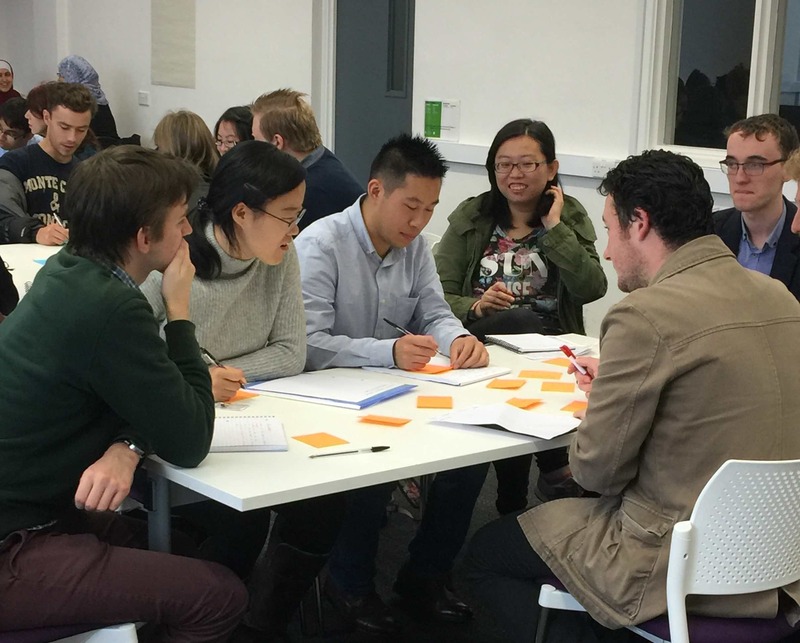 31 FREE opportunities for PGRs to explore key concepts and skills required to engage with collaborators outside academia and to develop your personal and professional research impact. The Leadership, Organisational, Staff and Academic Development Academy (The Academy) at the University of Liverpool invites you to your choice of any of 31 different sessions for Making an Impact Week 2018. 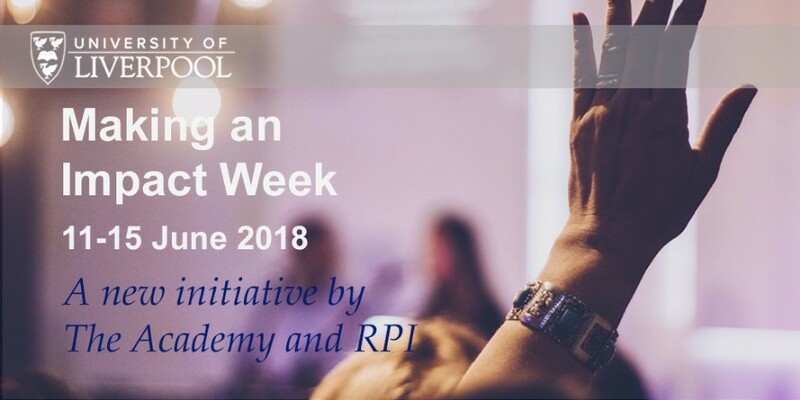 The Week is a new initiative aimed at providing rich, varied and high-quality development opportunities, and forms a unique opportunity for PGRs to network with academic, research and professional services staff across the University. Timed to coincide with the International Business Festival (IBF) 2018, the Week consists of an engaging mix of 31 different sessions, including workshops, panels, keynote speakers, 1:1 surgeries, and tours of facilities at the event taking place at various venues across campus. Making an Impact Week runs 11-15 June 2018. Hear about the Government’s Industrial Strategy and associated funding opportunities from Dr Rick Holland, the Innovate UK Regional Manager for the North West of England. The session is hosted by Professor Anthony Hollander, PVC R&I and will also feature a presentation from Professor Rasmita Raval, Director, The Surface Science Research Centre, who will speak about “Antimicrobial Surfaces: Innovation and Impact”, drawing on a range of Innovate UK projects that she has been involved in over the past 3 years. You are invited to register here. Universities have enormous impact on society and their communities. The Knowledge Exchange Framework (KEF) is being developed to help demonstrate the extent of this impact, the approaches that a university takes and the mechanisms by which we aim to continually improve what we do. The session will be led by Professor Trevor McMillan, (KEF Lead, VC Keele University). Professor Mark Boyle (Heseltine Institute) and Mark Basnett (Liverpool LEP) discuss the Liverpool City Region’s growing and uneven recovery as well as the city’s huge potential. The city region now has a metro mayor and combined authority, a national industrial strategy (and associated infrastructural strategy) and is well-placed to embrace a low carbon future, smart technologies and the digital age, welfare service reform, the circular economy, a jobs and skills strategy, and inclusive economic development. If you want to engage with external customers but are worried that you might not be well prepared – or even if your confidence needs a boost – then this workshop is for you. In this workshop, you’ll learn how to plan to make first contact and to deal with the awkward issue of price and payment for your work. Book here. Contemplating a collaboration, started working with third party data, want others to share with you or need to prepare to share your data? Come along to this session to hear about colleagues’ experiences using and sharing third party data and their research, followed by Q and A session with the panel. Book here. Ben Carpenter, Operations Manager from Social Value UK leads a discussion about the principles of social value in relation to research. Book here. This workshop will look at defining what research impact means, and in particular what it might mean in the context of PhD research. We will then explore practical strategies for using your time as a PhD candidate to raise your research profile and delivering real impact for yourself and others beyond the thesis. By the end of the workshop, you will have developed your own impact statement and plan for achieving that impact. Book here. This session will discuss how researchers can work with the media and what they can get out of it, and will be led by Andrew Naughtie. International Editor at The Conversation, Naughtie is used to working with researchers to get their work out to a general audience. He will explain some of the risks and rewards of using the media to reach people beyond the halls of academics. Also, hear from University Press Officer Matt Hurst, Professor Peter Kinderman and Professor Peter Shirlow about their experiences of dealing with the media. Book here. The impact agenda is far from new but impact continues to be conceptualised as an additional component to a research proposal rather than an embedded aspect of the research itself. This session will consider the shifting nature of the funding landscape and the increasing emphasis being placed on challenge-led and impact-driven research. This session will focus on the need to ‘normalise’ impact in this new funding context. This session will be led by the APVCs (R&I): Professor Georgina Endfield (HSS), Professor Malcolm Jackson (HLS) and Professor Ric Williams (S&E). Book here. This workshop will dispel many myths about intellectual property and will help you to identify, protect and disseminate your work to benefit a wide range of audiences both inside and outside of the University environment. It will also help you to confidently negotiate with external partners on collaborative projects so as to achieve mutual gains. Book here. Do you wonder how peer reviewers come to their conclusions when assessing your research writing? Do you worry that they are not seeing its value? Do you wish you could gain more benefit from peer review? Do you worry about reviewing other people’s work? This session will examine the peer review of outputs in preparation for REF 2021. Book here. Join us for the chance to share ideas, make new connections with professionals spanning industry and academia in the lovely setting of the Victoria Gallery Museum Waterhouse Café. Drinks and canapes served. Book here. A mini-workshop by Dr Ben Slater who will provide an overview of the funding opportunities available to researchers and academics will highlight their current projects, along with tips and advice on how to develop a successful project. The showcase will be brought to a close with a brief address by Prof Anthony Hollander, PVC R&I. Book here. Workshops to help you devise strategies to manage your research and professional development. Upcoming workshops from the LDC Development Team will help you take action to manage your personal and professional development and to develop your research productivity. Click on the titles below for further information and registration. ‘Chance favours the prepared mind’. Keen to gain extra support with your career planning? The Liverpool Doctoral College are offering a one hour face-to-face coaching session to help you with your career preparation, with a further follow-up session by Skype if required. This offer is open to all PGRs at any stage in their degree. The one to one coaching is delivered by Sally Beyer who has specialised career coaching experience. She will be familiar to many of you from our careers half day workshops and careers webinars. Dates: If you would like to book a free one hour coaching session with Sally, please follow the link on the preferred date below. These dates are offered on a first-come-first-served basis. Mondays 21st May, 18 June, 25 June, 02 July and 09 July. Please only register for one slot. Following your registration, a further pre-session form will be sent out for you to provide Sally with information to help her best prepare for your coaching session. Please return the form to gssp@liverpool.ac.uk. Your booking will only be accepted on completion of this pre-session form. Sally is a Careers and Learning & Development professional with over 22 years’ experience of training and coaching people from all walks of life. Along with working for two local Universities, Sally has worked with many private and public organisations delivering career management support to help staff at all levels to achieve their full potential. The Annual Progress Reports (APRs) to be released in June 2018 will, for the first time, include selected data from the PGR Portfolio of Activity. 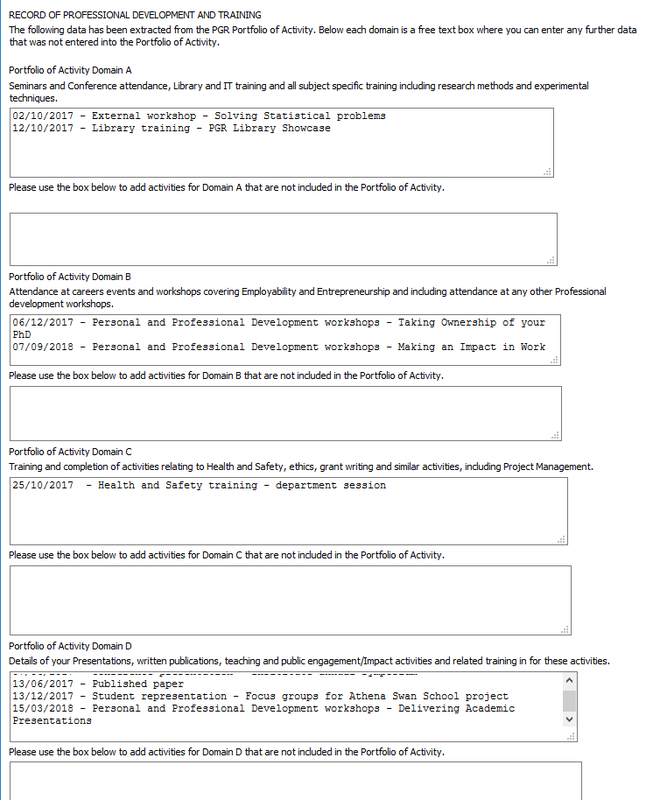 The data will be displayed in the APR under the four headings in the Portfolio of Activity, which correspond to the four domains of the Researcher Development Framework. Records with dates in the period from the 1st June 2017 to the end of May 2018. The type of activity, the title, and the date of the events that you have recorded in the Portfolio. Records that you have kept marked as ‘select ed’ in the Portfolio. The APRs will not include further information such as the description or the ‘RDF descriptors’ that you can add to the Portfolio of Activity. Further Guidance for the APRs: Further information on the changes to the APRs will be released during May, including the updated Student Guidance for 2018 to help you complete the form and the dates of supporting workshops organised by the PGR Student Team. If you have not entered data into the Portfolio of Activity, the APRs will include empty text boxes where you can add any additional information in relation to your professional development to record in the APR process. The choice of which box to use to record each training or development activity is only approximate and may be a personal choice. We recommend that you aim to complete development relevant to all sections of the Portfolio over the course of your PhD, as this will help you to make the most of your PhD experience and to prepare you for your ongoing career. 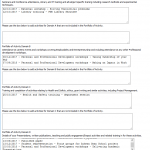 You do not need to add activities for all Portfolio of Activity sections within the APR form. Non-completion of any of these boxes will not delay completion of the APRs. The APR will display the data in a non-editable format, i.e. any changes to the Portfolio of Activity after the 31st May will not be reproduced in the APR. We recommend that you revisit the Portfolio of Activity before the 31st May and look over the data that you want to have included in the APR. You may want to check the event title to ensure that this accurately represents the event, since the event description is not included in the APR. For example, if this is a three day conference, you might include the dates in the title. If you do not want data to be transferred into the APR, please ensure that you untick the box in the column labelled ‘Select’ in the portfolio. Reminder – 31st May is the completion date for the record of Supervisory Meetings. As in previous years, the APR will also include the complete list of the dates of all supervisory meeting records that have been signed off by your supervisor. Please ensure that your record of Supervisory meetings is up to date before the end of May. You may also want to remind your supervisor that they should sign off of all records before the 1st June.